The Tigers are trending upward, but have a tough schedule in 2017. We’re closing in on the final 10 of The Comeback’s Top 50 countdown. As part of our 2017 college football preview, the list gets shorter each day, leading up to the opening of the regular season. Up next at No. 16, the Auburn Tigers. In his debut season as head coach at Auburn, Gus Malzahn came within one score of winning the National Championship. Four seasons later, Malzahn and the Auburn faithful are hoping that he can pull them out of the shadows of Nick Saban and the Alabama Crimson Tide. The last three seasons have been tough on Malzahn. The Tigers have gone 23-16 with a 11-13 conference record. That’s not what most were expecting after the way Malzahn debuted. The good news for Auburn is that they are trending upward with 2016 being the best of the past three years. 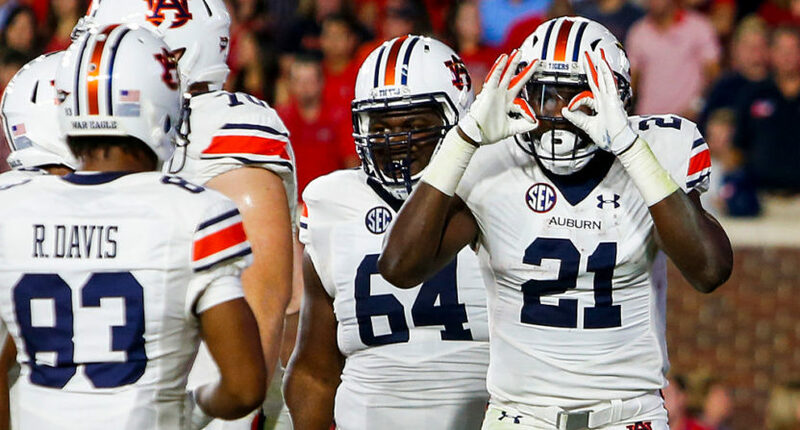 Can Auburn continue their positive trend from last season? Auburn’s 2016 season was bookended by a slow start and a bad finish. In the first three games and the last four games, the Tigers had a combined record of 2-6. In the middle of the schedule was a six-game win streak that showed Auburn’s promise and included victories over two Top 25 teams. Kevin Steele’s first year as defensive coordinator was a needed boost as the Auburn defense rose from 13th in the SEC in total defense to fifth. For most of the season, the defense was much improved. Two of Auburn’s six losses came despite their opponent failing to score 20 points. Gus Malzahn’s offense has to have a dynamic quarterback to function successfully. Sean White showed flashes, but was up and down and injured. Running back Kamryn Pettway came on strong but missed key stretches of the season and without him, the Auburn offense didn’t execute at a high level. Three of Auburn’s five losses came to teams that finished in the Top 5 and another came against a rival, Georgia, that failed to score an offensive touchdown. With Malzahn on somewhat of a hot seat last season, the Tigers defense helped them show the needed progress to give him a vote of confidence and a renewed eye on 2017. As usual, the Tigers recruited very well as they nabbed a 5-star recruit and 12 4-star recruits. This is Auburn’s lowest ranked class since 2013. Having a ninth-ranked class as his second-lowest ranked recruiting class in your tenure means that Malzahn has a lot of talent on this team. If you are looking for someone not named Jarrett Stidham that could have an immediate impact, then keep an eye on defensive end Markaviest Bryant. 10.12% – The percent improvement that Auburn made from 2015 to 2016 in terms of opponent third down conversions. Auburn went from 13th in the conference to fourth. It helps when the defense can get the opposing offense off the field. 20.9– The average number of rushing attempts that Kamryn Pettway had in 2016. This number was the most in the conference and includes a game in which Pettway played, but didn’t get a carry (yes, it was a loss). 14th– Auburn was 14th in the SEC in 2016 in offensive passing yardage. Depending on who’s running Malzahn’s offense, the Tigers have fluctuated in terms of passing yardage but at times in 2016, they could not move the ball because they were too predictable. Why it matters: These are the two teams that are picked to battle for second place in the SEC West. This has been a tough game recently for Auburn, as LSU has won seven of the last 10. LSU has also won the last eight games in Baton Rouge and the Tigers don’t have a road victory in this series since 1999. Why it matters: Auburn has the higher profile of these two teams but since joining the conference it’s A&M that has had the upper hand. One interesting fact about this series is that since A&M joined the conference the road team has won every game. Auburn is seen as above A&M on the totem pole this year and they must win this game. Why it matters: Gus Malzahn’s only win as a head coach against Georgia came on a miracle play. Since that game Georgia has won three straight. Georgia has also won 9 of the last 11 in this series which is the same dominance that Alabama holds over Auburn during the same time period. Malzahn and Auburn need to show that they can beat Georgia. Kamryn Pettway, RB – Once Auburn figured out what they had with Pettway, they turned him lose and he was a dynamic weapon for them. The key for the Tigers is to find other weapons so they don’t run Pettway into the ground and help him avoid losing time to injuries. Jarrett Stidham, QB – The quarterback is the most influential player on the field and because of the type of offense Auburn runs, it’s even more pivotal for them to have elite talent at this position. Stidham showed flashes of greatness at Baylor. He could be just what Auburn needs to jump back into competition in the SEC West. Tray Matthews, S – What a career it’s been for Tray Matthews. He’s gone from being on the wrong end of Auburn’s miracle win against Georgia to being the player that Malzahn sees as the leader of the Auburn defense. Auburn’s defensive backfield losses two starters so it will be key for Matthews to be the quarterback of the defense and help them maintain and improve on the success that they had in 2016. Auburn will beat LSU in Baton Rouge for the first time since 1999. Kamryn Pettway will rush for 1600 yards and 20 TD. At times, Pettway will channel the success that Tre Mason had in his final season at Auburn. Auburn will win nine regular season games and finish second in the SEC West. The ceiling is high for the Tigers, but they have a very tough schedule featuring potential Top 25 match-ups against the likes of Alabama, Clemson, Georgia, LSU, Texas A&M and possibly Arkansas. This will be a very good Auburn team if they can keep everybody healthy and catch fire at the right time. Follow the rest of The Comeback’s Top 50 College Football Countdown leading up to the regular season.